Any way to use a 2x1 scaling? 640x200 inside 640x224 with 8px borders on top and bottom? I don't think there is a way to do what you want to do without modifying the source code, but I am actually not sure this is what you want to do anyway. And I am not sure the sentence above actually makes any sense so let me clarify that. The original games with a 320x200 resolution were actually displayed with a 4/3 ratio due to the pixels being non square when displayed on CRT monitors. 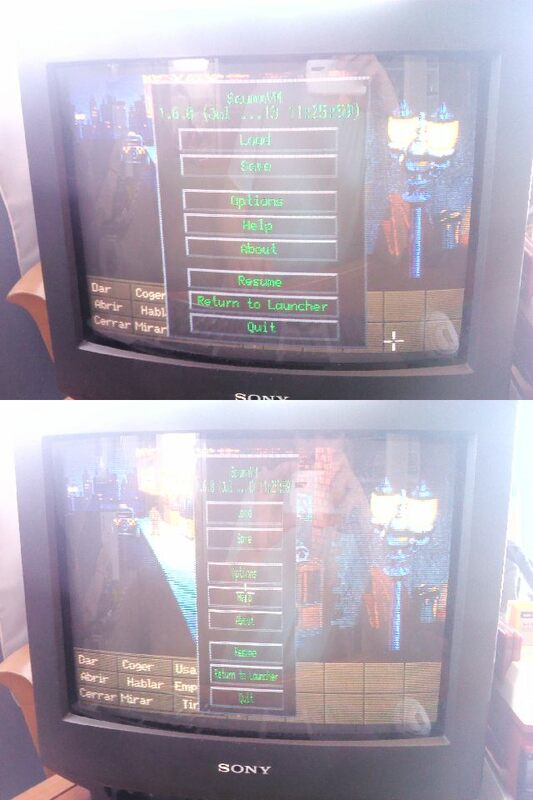 This is why we have a "Aspect ratio correction" option that stretches the display to 320x240 resolution: it allows displaying the game with the correct 4/3 ratio on modern screens with square pixels (see http://wiki.scummvm.org/index.php/User_ ... aphics_tab). But if the 4/3 ratio in your case is 640x224 (which is what you seem to imply with your last sentence), then this may actually be the resolution you might want to use. And from what I understand this is what you get with the OpenGL stretch case. criezy wrote: I don't think there is a way to do what you want to do without modifying the source code, but I am actually not sure this is what you want to do anyway.